After the sun sets, night safaris take over from typical game drives. Started by the fantastic Singapore Zoo in 1994, they have become increasingly popular over the last few years. On top of the excitement of a safari experience, the advantage of night safaris is that tourists get a unique chance to see nocturnal animals when they’re at their most active. Instead of watching a big cat snooze in the sun, for example, you’ll be able to glimpse their hunting patterns and routines! You could also spot creatures that rarely appear during the day, from aardvarks to genets. When evening falls in hot destinations, the setting sun takes away much of the overpowering heat of the day – another advantage of heading out into the bush or rainforest at night. The anticipation will start to build as darkness comes, when the calls of animals and birds increase to the backdrop of a vibrant, colorful sunset. Nothing beats sitting with a sundowner and waiting for your night safari adventure to begin! Sometimes, an afternoon game drive will be interrupted for cocktails with the sunset before visitors continue with a night drive and head back to camp for dinner. On a night safari in Africa, you could be lucky enough to see lions preparing for their evening hunt and setting off into the bush for a kill. 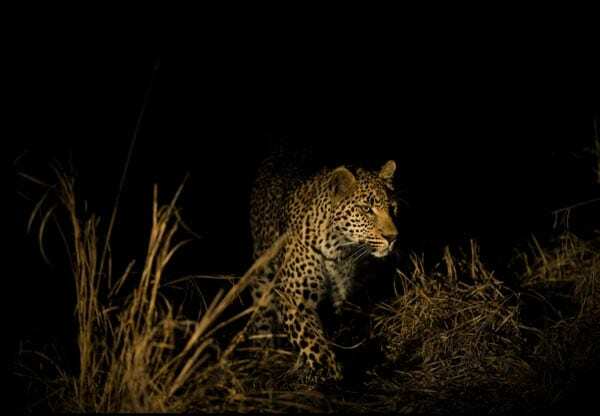 A leopard might be spotted on a nearby tree or bushbabies taking a leap from branch to branch through the canopy, whilst elephants trudge silently through the moonlight. Unfortunately, only camps and lodges on private land outside the boundaries of National Parks are able to offer night safaris. But these top night drive safari destinations will be sure to offer excitement! Named after a legendary elephant, Abu, this unique camp in the Okavanga Delta in Botswana offers one of the best experiences for interacting closely with elephants. Go for an afternoon elephant ride through the Delta for a unique perspective on the wildlife, followed by an exciting night drive through an area rich in game and nocturnal hunters like lions and leopards. In the famous Sabi Sand Private Reserve near the Kruger Park, this private resort is both the perfect place for sundowners with a view and a great location for a night drive. The huge diversity of wildlife means you’ll be sure to spot some wonderful animals and the knowledgeable guides and trackers will be able to illuminate a host of nocturnal species on a night safari. The world’s first nocturnal zoo, the vast Singapore attraction has over 1,000 species in an open-air tropical rainforest setting. Unlike traditional zoos, it offers animals the natural habitat and day-night cycle which they would use in the wild. Highlights include rare species such as tarsiers and Indian rhinos and the atmospheric lighting (similar to moonlight) spotlights animals without disturbing their behavior Visitors can soak up the atmosphere of the rainforest on foot via one of the walking trails or by tram; the animals are separated by natural barriers rather than typical prison-like cages for a real safari experience. Rules and regulations restrict where a night drive can take place in Africa. Be sure to check before travelling that the camp or reserve where you’re staying offers night safaris to avoid disappointment. Some safari camps have floodlit waterholes where you can spend a lot of time watching the comings and goings around this central area, rather than just driving from one place to the next to spot different species. Even in the middle of summer, the temperature drops fast after the sun sets so wrap up warm for a night drive. Dress in layers that can be easily taken off or added if you’re going out during both the afternoon and evening. Just like on a regular game drive, keep noise and movements in the vehicle to a minimum for a better chance to spot animals and observe their actions. Taking photos on a night drive can be challenging (see our post of safari photo tips). Many camps use red filter spotlights for illuminating animals as it’s much better for the animals and does not affect their night vision in the same way as white light. Camera flashes will also be prohibited as they can disturb the night. However, with a modern digital camera, it’s easy to brighten your ‘red’ image with the help of a computer editing program afterwards. Firstly, increase the sensitivity (ISO) on your camera to 1600 or more. Adjust the aperture to the maximum setting, such as 2.8 or 4.0. Change the shutter speed to 1/40. On a computer, remove the red tint by adjusting the colour. Add a sepia or black and white tone to improve the overall quality.